White Boys • Labs Pixlez Studio • Queen Of The Scene • Apocalypse Records and Azabache Entertainment Group LLC present an Official Medusa Agency and Dj Oski Gonzalez Show. We are still making a documentary for this years Kryptonite. It's been year in the making. If you have any old footage of your band or your experience at Kryptonite we would love to see it. If we use your footage and pictures for the documentary on Kryptonite Fest you will get credits at the end of the film. Be part of it. \m/ Thank you. 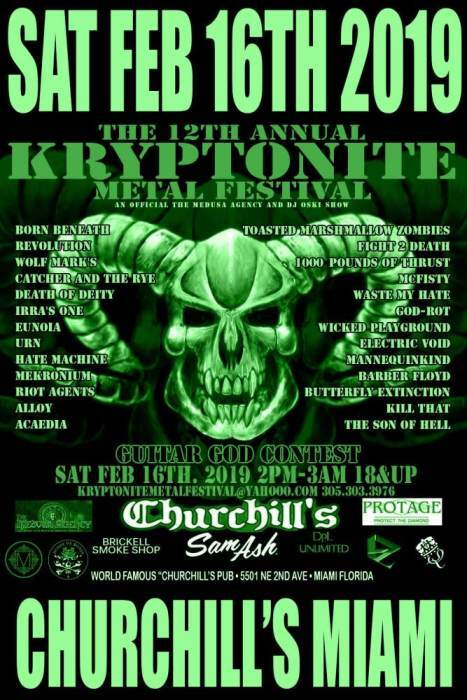 Winner receives $100 cash, a one of a kind Kryptonite Metal Festival guitar autographed by all the bands and more. Rules: You win be given 1 minute to do what ever you want on the guitar. The crowd and judges will pick the winner. 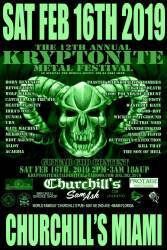 Coming soon "The Kryptonite Awards"
SUPPORT OUR SPONSORS AS THEY SUPPORT METAL!!! THANK YOU FOR 12 BADASS YEARS!